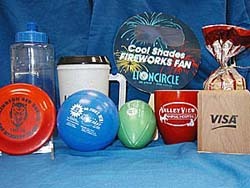 Promotional items are a great way to promote your company, event, organization or school. Items range from pens and keychains to more upscale items such as stainless steel mugs and electronics. Promotional items can be more than just a give-away for a one-time event. They can also be part of an employee recognition program or a fundraiser. Copyright 2012 Jims Trophies and Screenprinting. All rights reserved.